Newway Towing is a veteran licensed towing and roadside services provider in San Rafael. The company is proud to provide a range of professional emergency towing, roadside assistance and car lockout services to San Rafael residents, and to do their part to keep the city’s road’s open and safe. We provide our towing services through an affiliate network of independent tow truck operators, so will get the fastest service possible. New Way is continually open for business, so no matter what time of the day or night you need emergency towing services New Way will be there to help. The company works 24/7, 365 days of the year and what’s more the New Way team is always just a phone call away – and we promise to reach you ASAP. Emergencies happen. They are an unexpected, unplanned for nuisance and the only thing dependable about them is the knowledge that they will sometime occur, and usually at the worst possible time. So, if you can’t plan for an unexpected emergency at least you should know how to do to deal with them once they happen. The best way to deal with any roadside or towing emergency is to call Newway Towing. From the moment you speak to our dispatch we will start solving your problem for you. The biggest advantage of calling New Way Towing is that you can be sure that you have someone with you throughout the entire time, from that first phone call and until we have towed your vehicle. Our dispatch will answer your call and get all the necessary information from you. Then we will give you a price quote, so that you already know in advance how much the emergency towing will cost you. We don’t like hidden surprises either! And, Newway Towing offers very competitive prices. 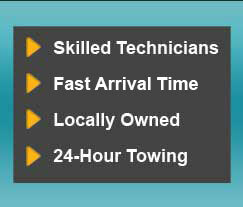 Newway Towing’s team of licensed towing operators will be with you ASAP, so you won’t have long to wait at all. In the meanwhile we can help you over the phone by explaining how to keep yourself and your family safe while you wait. New Way has a team of professionally trained, certified tow operators who are always very well prepared for every call. The company has a top of the line fleet of tow trucks which is always equipped with the most modern gear, to enable us to work more efficiently. Our goal is to deal with emergency situations in the quickest, safest way possible. The New Way team is proficient when it comes to working with all makes and models of cars, so no matter what you drive we will be able to help you. And, one of the big advantages of Newway Towing is that we always arrive with a smile! We are always happy to speak to our customers, whether you need our help in an emergency or you have a question. We suggest saving our number in your mobile phone’s emergency numbers so you can find us easily when you need us.